To add protein to this simple yet delicious meal, this recipe calls for an egg, milk, and cheese. If you have time to let your store-bought spaghetti sauce simmer, you can also add broccoli (one cup of chopped broccoli has about 3 grams of protein all on its own) and mushrooms (almost 2 grams of protein in a cup of chopped mushrooms). Many grocery stores now sell pre-chopped and pre-washed vegetables, so don't be afraid to experiment. You can add more of your favorite veggies to increase the number of nutrients in your meal, but don't worry, you don't have to deviate from this recipe at all — it's tasty all on its own. Before popping the casserole dish into the oven, you can be quite liberal with the shredded cheese. There is nothing like a golden brown cheesy crust on top of a casserole to make your mouth water. When finally done, serve with a green salad (Caesar salad works great with this recipe) and some freshly made garlic bread. Bring a large pot of water to boil. Add the spaghetti, and cook 1 to 2 minutes less than the package directions suggest. Drain well (but don't rinse with cold water, no need to wash away all the starches). Pour half of one jar of the spaghetti sauce in the bottom of a 9 x 13 baking dish. Beat the egg and the milk in a large mixing bowl. Add the remaining spaghetti sauce to the egg and milk mixture. Mix well. Add the drained spaghetti to the sauce mixture, stirring to coat it will. Spread the spaghetti mixture in the prepared pan. Sprinkle the shredded cheese evenly over the spaghetti casserole. 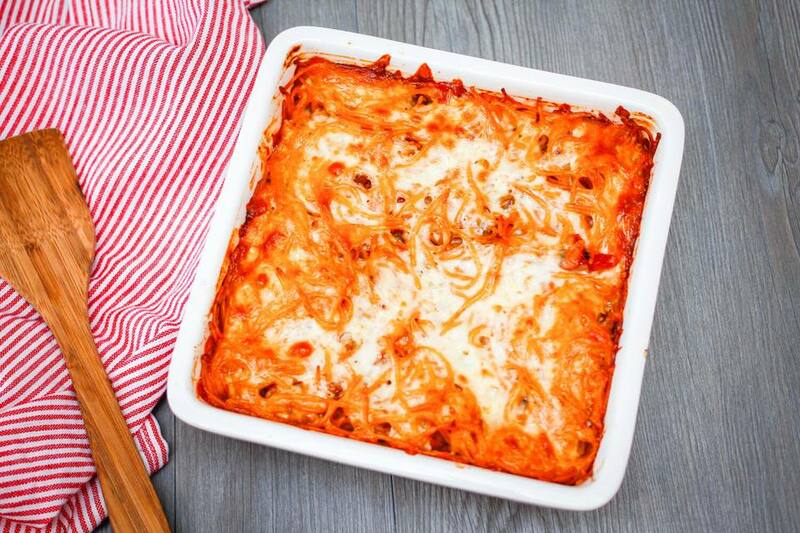 Bake the spaghetti casserole 30 to 40 minutes, until the casserole is bubbly and the cheese is golden brown. Let the spaghetti casserole rest 10 minutes before serving. Divide into sections and serve with a salad and/or garlic bread.